By Rail- Kumarghat is linked by railways to Guwahati, which is in turn connected to the rest of the country. 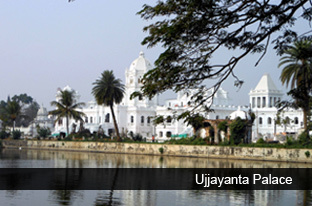 Agartala is well connected to Lumding & Silchar by daily Agartala Lumding express. By Road- National Highway No. 44 connects Agartala to Guwahati via Shillong in 24 hours. The tiny state of Tripura is a land full of surprises. Historically, the region finds its mention in the form of Mahabharata, Ain-I-Akbari and the Rajmala, the royal chronicle maintained by Brahmin Purohits. In its long past, the state over the Hill Tipperah witnessed the kingship of 183 kings in series. In the fifteenth century, the region saw its conflict with the Mughal governors of Bengal which became the reason of Tripura’s decline. The situation delineated further with the reach and control of British in Tripura. Post independence, the kingdom of Tripura was eventually absorbed into the Indian Union in 1947. Geographically, this remotely located state shares its international boundaries with Bangladesh and internally the state shares its borders with Mizoram and Assam. Primarily hilly in nature, the topography of Tripura is based on three hill ranges rising to high altitudes. The ranges in Tripura include Jampui, Deotamura, Baramura and Atharamura. 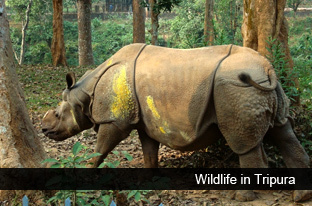 The flora and fauna of Tripura is equally exciting. The forests here cover around 58% of area. These forests serve as a splendid backdrop for mixed deciduous, sal, bamboo and cane forests. The plains of Tripura also feature the grasslands and swamps. The wildlife sanctuaries in the state also flourish in Agartala, the state’s capital and host a number of endangered species like wild dogs, porcupines, bear, elephants, wild boars, etc along with rare variety of 90 birds. Culturally, the state is influenced by Bengal. During the times of monarchy, Bengali served as the language of courtly Tripura. The 19 hill tribes of the region also dominate the culture of Tripura. The Tripuris form the largest tribal population and the Reangs, who hail from Chittagong are the second largest amongst the tribes of the state. Other tribes include the Jamatia, Noatia, Darlong, Halam, Garo, Chakma and Kalai. This elaborate tribal culture rules the state and makes it an amalgam of racial diversity and lends an enchanting charm to the destination. This culture is also present in the form of folk songs and dances, tribal handicrafts and festivals of Tripura, making it a treasured destination. Hotels – This remote state is working continuously to promote hospitality standards in order to derive tourism potentials. Currently, there are many hotels in Tripura ranging from budget accommodation to five star that heartily cater to the discerning tourist in the state.